Bring the Inlaws! Separate apartment perfect for extended family. Separate ground level 2 bedroom apartment/suite allows private space equipped with 47' PLASMA TV, King size Master bedroom and one additional bedroom. Also has it's own eating area and kitchenette. This property does not include a golf cart. Golf cart rental companies will be recommended by the owner. Refund policy- full refund is given 30 days prior to arrival date. After that, date, a refund is given only if the owner is able to rebook the property. This spacious, Low Country house is situated on a quiet street just a four minute walk to center island beach access... one minute by bicycle. Porch access and views from each room makes the light and lush landscape a part of the WOW factor! The spacious living room area provides comfortable seating for entertaining, and the dining room accomodates eight with overflow to the screened porch. The big, bright, open fully stocked kitchen has 30 feet of countertop - great for multiple chefs and buffet dining. Two of the bedrooms have direct access to porches. Upstairs baths are fully tiled with tub/shower combinations, In-law suite bath has been renovated and includes tiled shower. Separate Washer/Dryer room. Pets are NOT allowed and No Smoking. Off-street parking accomodates several vehicles - even a place for the boat! Best of all, Fripp Island is a wildlife sanctuary, and deer frequently roam our front and rear yard. Even better, Fripp Island is frequently visited by Loggerhead Sea Turtles nesting on our shores. Keywords: 'Summer Hours' .Attached apartment, big kitchen,updated, king size beds,screen porch,walk to beach,Golf Cart, Amenity cards. 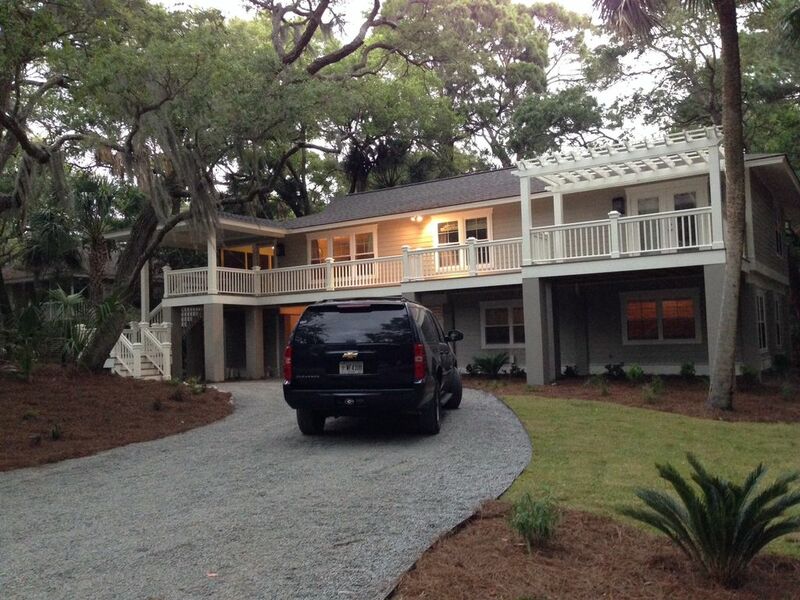 We have vacationed at Fripp, with extended family, for 20 years. Now we're so happy to own a home at our favorite vacation destination! Fripp Island is truly a special place to make memories. Mid-island is our favorite part of Fripp. Every beach and island amenity is within a quick bike ride, yet the privacy on this quiet street defines relaxation. The natural setting gives us lots of privacy. We are located only four minutes from the beach for those long morning walks, and the tennis courts, olympic pool and bike path are just minutes away. Enjoy exploring the entire island by golf cart or bikes, which can all be rented through the resort. a short half-block to beach access, with a new boardwalk constructed in 2017. We are members of the Fripp Island Resort, so you can purchase guest cards through us. This give you access to pools, golf, tennis and restaurants on the island. Both units replaced in Spring of 2010. Stainles, replaced 2016. Second refrigerator in the apartment. Has 30 Feet of Counter Space - perfect for multiple chefs. Plasma T.V's in Family rooms, also tv in master. Screened porch adjacent to Living/Dining Room equipped with table and chairs for dining. 3 Private Pools available to guests.